Here's a giveaway with a random selection of prizes available totaling $300. Three winners in all. Just one form to enter through, not one for each. You have through 7/29 to enter to win. Good luck. 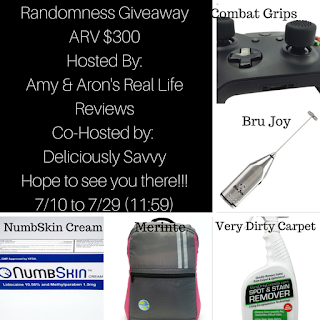 This is an GREAT giveaway of a bunch of awesome random stuff that I have reviewed lately. Thank you to all of the bloggers that helped me promote this and all of my giveaways. Without all of you none of this would be a success. Thank you so much to all of our readers. Without you none of this would be possible. If you have any questions about this giveaway or any of the prizes listed please contact us at grovesamy81@gmail.com. Most excited abou tMerinte Back Pack. I am most excited about the Dirty Carpet Cleaner. I am most excited about the milk frother!